We’d love your help. 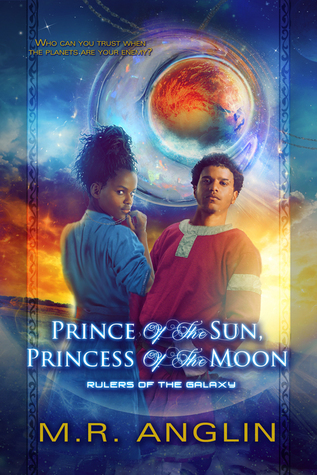 Let us know what’s wrong with this preview of Prince of the Sun, Princess of the Moon by M.R. Anglin. For years the Moon Palace in the Valley of Aijalon and the Sun Tower in the Plains of Jashar has stood as testaments to the power of the sun and the graciousness of the moon. Helio and Lumina, Guardians of the sun and moon, kept watch over them and the Prince and the Princess who ruled them. But the Prince and Princess are missing, and the sun is exhibiting strange behavio For years the Moon Palace in the Valley of Aijalon and the Sun Tower in the Plains of Jashar has stood as testaments to the power of the sun and the graciousness of the moon. Helio and Lumina, Guardians of the sun and moon, kept watch over them and the Prince and the Princess who ruled them. But the Prince and Princess are missing, and the sun is exhibiting strange behavior. To ask other readers questions about Prince of the Sun, Princess of the Moon, please sign up. This book is an amazing sci-fi read! The world is very well created, and I love the characters in it. I especially enjoyed seeing the story from so many points of view, even those considered the enemy. There are quite a few surprises, and enough of a mystery to keep you reading until the very last page. And I loved the characters, and the development of each of them! This book is so interesting in that it feels like a YA novel, but it also fits as a middle-grade novel, and with enough intrigue f This book is an amazing sci-fi read! The world is very well created, and I love the characters in it. I especially enjoyed seeing the story from so many points of view, even those considered the enemy. There are quite a few surprises, and enough of a mystery to keep you reading until the very last page. And I loved the characters, and the development of each of them! This book is so interesting in that it feels like a YA novel, but it also fits as a middle-grade novel, and with enough intrigue for adults to enjoy as well. Altogether, this was a novel I thoroughly enjoyed, and one I highly recommend. I honestly can't wait for the continuing stories of this series!